Looking at the early issues of the Newsletter it struck me that the technology has changed so fundamentally that later generations would have no idea of the labour and skill involved in producing them. As editor, I had to assemble all the items in the order they had to appear before they could be typed, because nothing could be inserted or moved as with word-processing. The snag with this was that the Head's Letter came first, and there was no way of guessing how many lines it would occupy, but as Heads came and went one thing never changed; their reluctance to get round to the task, so the whole newsletter was held up. The production was then the work of Margaret Vaughan, and involved a range of skills, plus considerable time and effort. She had to go into her husband's office on Saturdays to use the equipment there. Everything had to be typed on a typewriter onto special stencils. These were paper sandwiches held together at the top edge with a layer of carbon paper in the middle. Any mistakes involved winding the stencil down until it could be opened up and liquid-paper applied onto the bottom sheet of special slippery paper. Then carefully wind back up into the original position to type the correct version through the carbon onto the bottom sheet, so it would later 'take' printing ink. Margaret also had to have the layout worked out before typing, including keeping within margins and deciding how much space to allow between items without wasting printing paper by running onto an extra sheet. Next came the printing (generally called 'duplicating'). Gestetner machines had to be filled with liquid ink, which was a messy process, as was opening the stencils and pulling off the carbons with the top papers, and removing used stencils from an inky machine roller. The results of using stencils were sadly patchy compared to laser or inkjet printers, both from uneven pressure applied by typewriter keys through carbon and uneven spread of ink. The early issues were produced by hand, turning a handle to print one side of print at a time. Margaret had to count as she did so, and around 400 copies were needed. 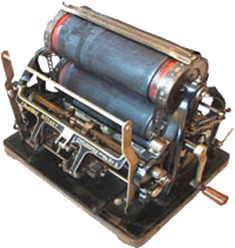 Later, an electric Gestetner automatically fed and counted the sheets – a great improvement! Then Margaret Campbell joined Margaret Vaughan to staple the pages together and fold the magazines to go in envelopes. And Margaret Vaughan also had to type all the addresses on the envelopes each time. You will also notice that the standard size of paper changed in the late 1980s, as Britain stopped using 'foolscap' and joined the international standard of German origin.